Play a bad card (0 skill is bad) to sometimes make the opponent discard a card, but he drew one so you are still down on the deal overall. Not one I'll be considering in a deck. Also, since it says "a card" not "one or more cards", does that mean it doesn't work against anything allowing 2 or more cards drawn? This is almost entirely a Character that acts as a Support since it won't be succeeding on stories on its own, but sometimes the extra combat icon is usable. The ability restriction is unfortunate, because if you want to lock somebody down from drawing cards, you want to do it when they have few to no cards in hand. So you're got to be skint to make this count when it's at its best. Worse, the effect only responds to cards drawn through an effect, which doesn't include the draw phase. 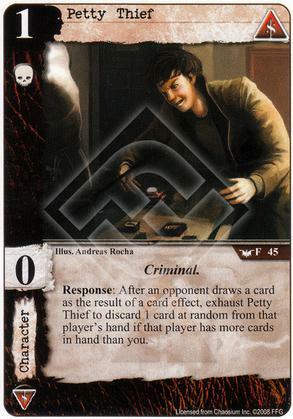 Syndicate have a few cards that allow your opponent to draw, probably the worst kind of mill in the game, and this character is used to remove the disadvantage of those cards. Clover club deck is probably the best of those cards and when combined with 2x petty thief can prevent your opponent from ever having cards. This is a card that has to go into a specific type of deck but it does have its uses.